It was announced last Friday that Luhan is leaving Sing Out for personal reasons and will be replaced by Angela Zhang. However, the change in cast snowballed into a controversy due to rumors that the show's Director Cen Junyu is extremely disappointed with Luhan. In a personal chat allegedly blasted by the Director, he criticizes Luhan for being unprofessional, having no basic ethics and how far he can go in the industry, only time will tell. It is implied that Luhan allegedly dropped the show as he left for Japan with girlfriend Guan Xiantong without thought for other's effort and time even as the two other cast members (Show Lo and Li Ronghao) had to constantly adjust to his schedule. After the news came out, Director Cen Junyi has denied saying anything about Luhan and that he most definitely had not written anything against him. However, there's another chat circulating allegedly from the Producer Li Yanchun this time also expressing discontentment over a guest leaving that has greatly damaged the show. Whatever the real reason is, the change has been done. Luhan is out of the show and Angela Zhang is in. 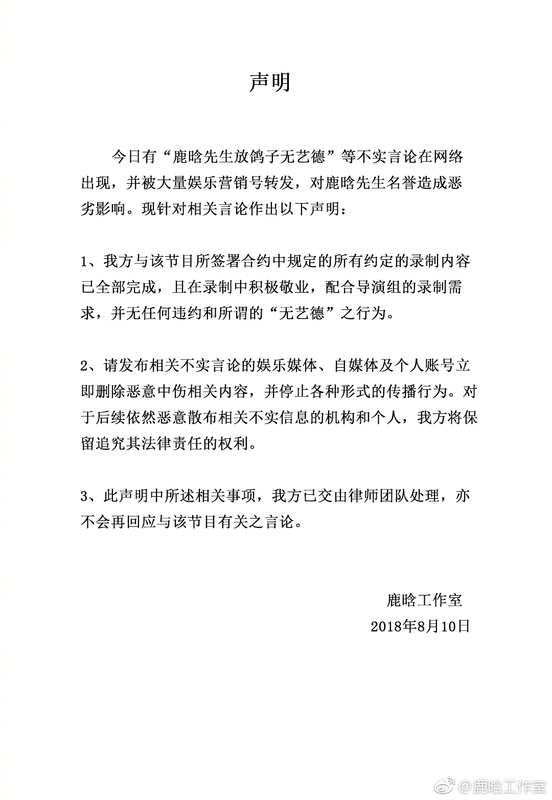 In response to the rumors, Luhan Studio has released a statement to explain that they have already fulfilled all of their obligations stated in their contract. They have remained professional and worked hard to cooperate with the Director and crew and that there was no lack of basic ethics. 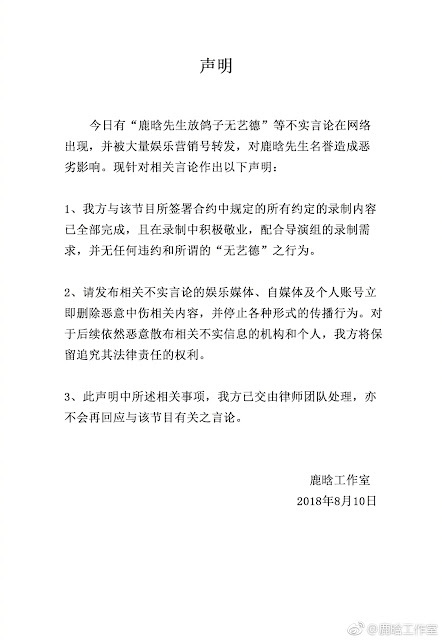 On malicious rumors against the actor, Luhan Studio asks that the false statements be stopped immediately and that they reserve the right to take legal action. Luhan Studio will no longer be responding on the matter. Lu Han's been one of the popular "xiao xiang rou" after he left EXO in China. Time will tell whether he can go far in the industry. If what Director and PD stated are true, words will go around in the industry. Luhan will definitely go far and always in high demand in the industry, he has a lot of support from the fans and public. His shows always bring in ratings, be it movies, dramas and even variety shows, not to mention the whole amount of CFs he has. It can also be said that no one can top Luhan's fame in China even with the current or ex chinese member of EXO combined. If one day he is slowing down in the industry it's because he wants to settle down n have a family. that doesn't have anything to do with the article though lol? Luhan career is already slowing down and his popularity is not as invincible as it used to be. He has no sense of direction of what he is doing whether it's variety shows, music or acting projects. Just watch the behind the scenes of his HBDC performances and he looked like he regretted being on the show. Also Sweet Combat has mostly negative reviews and China is starting to be tired of overpaid actors/actresses. Luhan has 2nd Tour on early october so clearly he will only signed for few episodes only. He accept this program as a favor for director who used to work together on Running Man China. If your program didn't receive enough hype, spend your effort into making it more interesting, instead of using dirty trick to dragged Luhan as your last resort. Just because Luhan didn't have big agency backing him? That's such a low move. I'm glad people who works with Luhan on Hot Blood Dance Crew defend him. Luhan has been very professional throughout his entire career. totally agreed. you think variety show is very easy especially show like keep running, everything you are is exposed in the show. who said luhan is not professional, if he is not then why HBDC team support him for keep running carnival?